Since 2000, there have been more than 30 reported deaths as the result of deck collapses. And while most collapses were caused by deck age, occurring on decks more than 20 years old, many were the result of poor craftsmanship. Failing to Seal Wood: Unsealed wood deteriorates and ages much faster than sealed wood. Improperly Built Stairs: Failing to cover risers or install a hand railing can greatly increase the risk of injury. Improper Railing Height: Building codes have very specific measurements for railings for a reason! Missing Joist Hangers: Nails alone cannot and will not do the job. Joist hangers are essential. Undersized Structural Members: Undersized members increase the risk of sagging, improper weight distribution, and collapse. Improper Deck Materials: If you don’t use water resistant materials, you are just asking for trouble. Undersized Footings: The footing is the base of your deck. Undersized footings will just not do the job. Failing to properly attach the deck to the House: Using incorrect fasteners can compromise the entire integrity of your deck. Missing Flashing: Without proper flashing, water can soak into your home at the point where the deck connects to the house. Failing to trust Freedom Fence & Home: Don’t try to cut corners to save money. 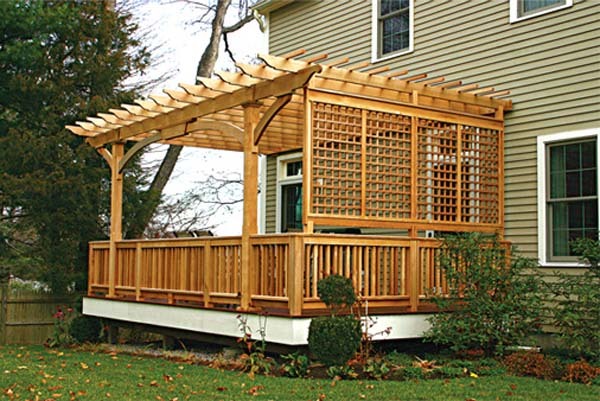 Rely on a professional deck builder, like Freedom Fence & Home! As a small company, we focus our efforts on satisfying you, the customer, giving you the attention you deserve. And because we are a smaller company, you will not be paying big company prices! This entry was posted on Tuesday, November 20th, 2012	at 6:37 pm	. Both comments and pings are currently closed.